Welcome to the People for Native Ecosystems website. Our mission is to protect, nurture and maintain Santa Fe’s imperiled population of Gunnison’s Prairie Dogs as they are vital links in the native ecosystem. Gunnison’s Prairie dogs are one of northern New Mexico’s original inhabitants who lived freely throughout this vast land for thousands of years. They play a “keystone” role in the grassland ecosystem which means that over 200 other species depend on them for habitat and food. Predators such as golden eagles, badgers, coyotes, the rare black footed ferrets and many other threatened birds, insects and animals are dependent upon the prairie dogs. Their tunnel systems benefit humans by channeling rainwater into the water table thus preventing runoff and erosion and serves to change the composition of the soil. Prairie dogs are intelligent rodents with a language of more than 500 recognizable sounds according to Dr. Con Slobodchikoff, of Northern Arizona University. He has been studying, recording and interpreting “prairie dog talk” for over twenty years. 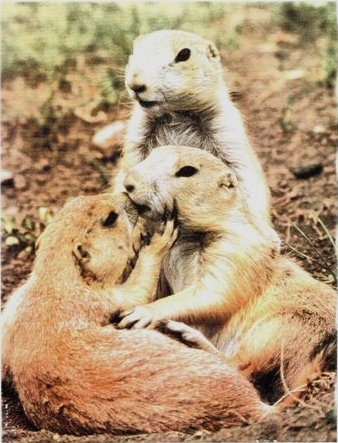 The prairie dogs live communally in well-developed interdependent villages, colonies and coteries, often making social visits and greeting each other with a kiss. We feel they have much to teach humans in this regard. However, their future is bleak unless they are protected, relocated and supported through supplemental feeding and attention to their needs because daily, drought and civilization are encroaching upon them and crowding them further out of their natural habitat. From March until October, an actual prairie dog village can be enjoyed at Jackalope 2820 Cerrillos Road.